Some of my fondest memories of my dad involves impromptu dinner out with my siblings while my mom was working nights. We'd pile into the car, head over to a local restaurant and splurge on appetizers and desserts. It was awesome. I cherish those memories with my dad and it makes me think of what memories my little guy will have to look back on as he gets older. My dad has also been one of my best recipe guinea pigs in that he is always open to trying up whatever I concoct in the kitchen. He's been so supportive and willing to try things I make... and for the times he doesn't like something, he'll find a nice way to make me feel better lol! 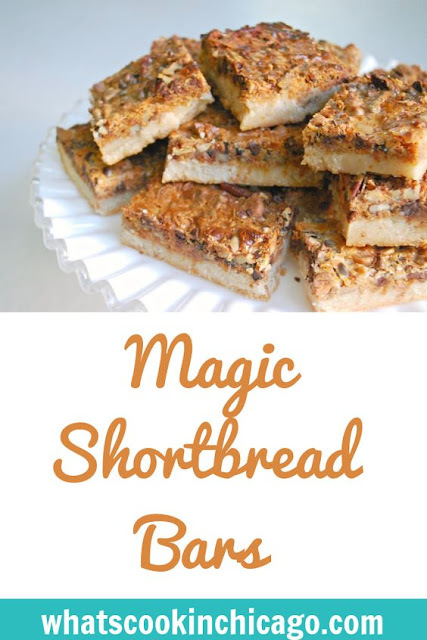 So back to these Magic Shortbread Bars... I have to admit I did get some help from my friends at Krusteaz. Their shortbread cookie mix provided the most buttery, delicious cookie base to build the bars upon. Did I mention how much of a time saver it was too?! In fact, if you want the Magic Shortbread Bars recipe, head on over to Krusteaz to get all the details!